With the anniversary of UC President Janet Napolitano’s appointment, the UC Office of the President invited student journalists to ask President Napolitano questions regarding her first year as well as her initiatives moving forward. She said for her second year she will focus on implementing initiatives that have already begun, including the UC-Mexico initiative, Global Food initiative, efforts to reach carbon neutrality by 2025, diversity among students and faculty and the support for basic and applied research. Below are key questions she addressed. Tuition has been frozen for the third year in a row and state funding for the university is far below what was expected this year. At the UC Regents meeting in September an imminent budget shortfall was discussed as the university is facing up to $340 million for 2015-2016 in mandatory cost increases and other items such as faculty salary increases, deferred maintenance and support for enrollment growth. According to Gov. Jerry Brown’s current funding plan, only $119 million will be provided by the state. President Napolitano said when the UC Regents meet in November they’ll have to look “at a whole range of things” but “did not want to predict” on what she thought the Regents would do or what she would be proposing to the Regents. Citing unexpected costs fighting fires in California this year and lower than expected tax property revenue, Gov. Brown vetoed legislation that proposed a $100 million boost to the UC and CSU system. $50 million would have been allocated to each system for critical deferred maintenance. The extra $100 million was meant to boost the UC and CSU budgets after property taxes did not generate enough revenue. President Napolitano said rather than call him after the veto, she would “keep her powder dry” as she expects he will be re-elected in the next couple of weeks and there will be plenty of time for a larger conversation. Gov. Brown signed legislation requiring “affirmative consent” making California the first state to define ‘yes means yes.’ The law also requires universities to follow certain protocol when investigating sexual assault reports. 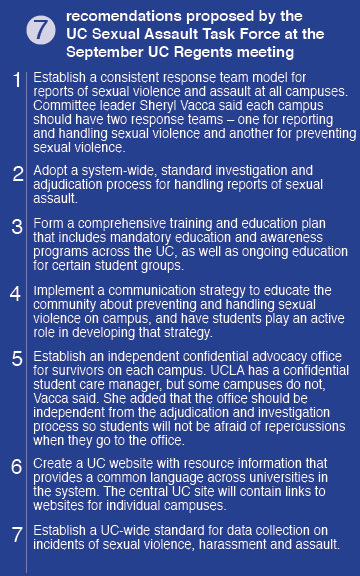 During the last Regents meeting in September the Sexual Assault Task Force presented seven recommendations to the board, which are set to take effect next academic school year and be fully implemented by fall 2015. Funding for additional resources for campuses to apply the task force’s recommendations will be found this year, President Napolitano said. She said she agrees with having an independent advocate on each campus and she is currently working on that. She said the university needs better training, education, awareness and common investigation techniques across the system by trained staff. This is the first year Latina/o students enrolled exceeds the number of white students at the UC. UC-wide, 27 percent of all fall 2014 applicants were Latina/o and 28 percent of the pool were white/other. Out of the admitted applicants, 26.7 percent of the Latina/o students submitted Statements of Intent to Register (SIRs), which exceeded the 24 percent of white students who submitted SIRs. At UCSC, 34.8 percent of the SIRs were from Latina/o students and 29 percent from white students. While the trend of more Latina/o student SIRs than white student SIRs was reflected overall in the UC, many campuses — including Berkeley, Davis, Los Angeles, San Diego and Santa Barbara — had a higher percentage of white students in their SIR numbers than Latina/o students. When President Napolitano entered office as the UC President a year ago, many students were critical of her previous job as U.S. Secretary of Homeland Security, claiming she would make undocumented students feel unwelcome and unsafe. She quickly announced a $5 million plan to increase support and resources to undocumented students across the UC system. The non-tuition allocation would fund extra advising and financial services to the estimated 900 undocumented UC students, according to the University of California Office of the President (UCOP). Gov. Brown signed three immigration reform bills on Sept. 30, most notably legislation to the State Dream Loan Program which provides $9 million to award loans for undocumented students at UCs and CSUs. The UC Regents awarded pay increases for the three lowest-paid chancellors — UC Santa Barbara, Santa Cruz and Merced — on Sept. 18 to “correct injustices” since their base salaries were below the average of chancellors at comparative universities. UC Regent Bonnie Reiss said the “Board of Regents feels it’s still not enough” and expressed regret that the raise was so little. UCSC Chancellor George Blumenthal, who was the lowest paid UC chancellor with a base salary of $319,300, was raised to $383,160. Many labor union representatives have expressed their frustration with the pay increases at a time when the UC faces tuition hikes and much-needed safety maintenance. In response to the timing of the raises — when the UC is facing a budget shortfall — she said: “There’s never a good time to do it.” She said the Regents were looking to improve the salary package for the new UC Irvine chancellor, highlighting the difference between new chancellors’ packages and ones for long-time chancellors. During a meeting in September, the University of California Regents voted to not divest from fossil fuels. The task force, convened by Chief Investment Officer (CIO) Jagdeep Singh Bachher presented several recommendations, which included a “more holistic approach” to considering responsible investments. The Regents set up an Environmental Social Governance (ESG) framework to review all investments. Divestment movements have spread to more than 300 campuses nationally. In April, UCSC’s Student Union Assembly voted to pass a resolution calling for the divestment from fossil fuel assets in the $6.5 billion UC General Endowment Pool. Activists called for divestment of $500 million — the estimated amount that the UC owns in various coal-related holdings. The Regents set aside a billion dollars to invest in sustainable technologies. Napolitano clarified that investments are made not with tuition or state appropriated dollars but with faculty and staff’s pensions, endowment funds and working capital. She said the while ESG framework does not prevent divestment, it also does not address divestment as an option at this point. UC Ventures, the new plan to fund campus start-ups was announced in September and will allow direct investments into research coming out of the university. Previously, the university arranged exchanges for providing resources like laboratory space for licensing fees and royalties. The fund could take up to $250 million to focus on work coming from the UC system. Gov. Brown signed a law creating a pilot program that will allow some community colleges to offer bachelor’s programs in vocational fields. Community colleges in 21 other states offer bachelor’s degrees, but as outlined in the Master Plan for Higher Education, California’s colleges offer associate degrees. The program is set to begin by the 2017-2018 academic year and end in 2024. President Napolitano said the legislation reflects the increased demand for higher education in California, but that the accreditation for those colleges will take effort. She said the governor needs to consider why the state has a public research university, what’s different about the UC and why it merits additional support within the system. Former UC President Mark Yudof formed a working group, which turned into a task force and is now a permanent council to address LGBT issues. Two of the recommendations from the council were approved by President Napolitano this week — installing gender neutral restrooms, turning single stall bathrooms in any UC facility to genderless and allowing students to use a preferred name on campus records. President Napolitano said she wants the university to be leader LGBT students’ rights. “I will look to that council as a primary convener or primary source of ideas on what we do as a university to be a welcoming and safe space for all members of the LGBT community,” President Napolitano said. 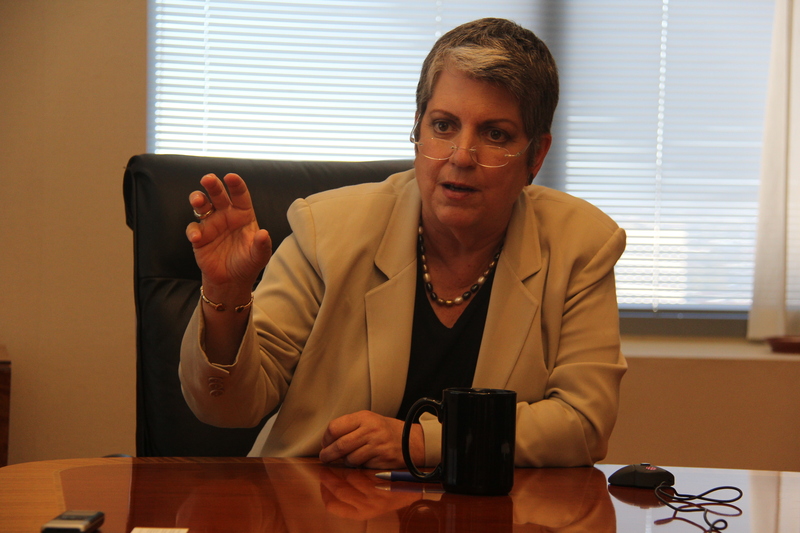 After the May shooting at UC Santa Barbara, President Napolitano said UCOP and the Regents would work toward addressing student mental health issues. With Proposition 63, the Mental Health Services Act ending soon, the university no longer have the additional funding to continue its mental health services initiatives in the same way. She said UCOP has been looking at ways to supply services at all the campuses and that in some areas there is a “lack of providers.” But they are looking at the university as a whole to improve resources. President Napolitano also said they have been working closely with UCSB Chancellor Henry Yang to discuss making Isla Vista a safer place to live. She said funding for mental health services will take time and may require a fee increase to pay for the additional services the UC currently doesn’t provide. Current services, she said, should be assessed to assure the delivery to students.